I tried this in a bar and loved it – so I bought myself a bottle. Quite an oily malt. Nose - sweet, dried fruits mainly raisins and sultanas, caramel and vanilla, slightly spicey reflecting the short fermentation. Palate - sweet, caramel, good mouth fill, oily, even slightly waxy suggesting a lower fermentation temperature. Finish - short to medium, seems to disappear and then return with a sweetness, caramale, dried fruits, tannic at the end reflecting the European Oak for the sherry finish. As a Speyside is quite good. For Speysides I preferred the Tamnavulin recent release Double Cask, and considerably less expensive in Supermarkets for ?22. A tremendous buy and great value for money. More body and greater flavour profile. This, for me,, is as good as This malt will always be in my top ten favourite single malts., from an excellent distillery too. Drinking neat: Fruitcake, floral, honey, spicy, cologne, sugar sweet, oak. Pretty tasty and light, buy there's nothing there that makes me want more. I bought this as a sampler. I'm content with this and don't see myself buying an entire bottle. If someone offered me a dram, I definitely wouldn't decline. A fine single malt whisky at a good price. Absolutely worth a try if you've not delved into Glenfarclas whisky before, my wife bought me a random bottle and I polished it off very quickly. Extremely drinkable and flavoursome. This my father in laws introduction to SM and it was mine too. Maybe it will always hold a special place for me due to that reason or maybe it is actually just really nice??? Sherry ish like balvenie double wood but not as harsh. I tried this one very recently and was pretty impressed with it and its certainly very good value for money. its light, very easy drinking and one I would highly recommend as either an easy drinking bottle to keep in the house for a rainy day or as a starter for somebody newly introduced to whisky. Will be buying another bottle for sure. I find some of the comments on here quite silly. It is a very good whisky at a very good price. Its still a family buisiness. If its not to your taste fine, but please do not make such childish comments like some have done. how can anyone say this is a mixer! for the money this is one of the best 10 year old's out there. quality stuff in an age of greed! 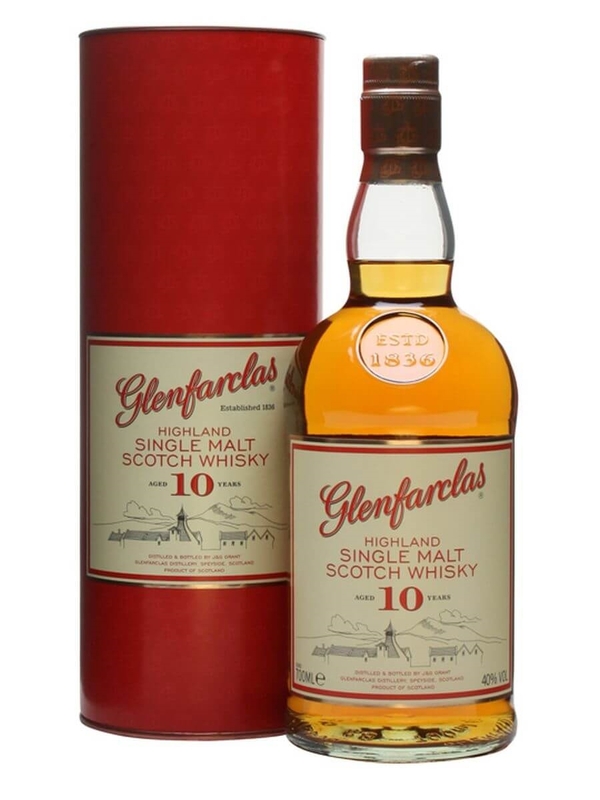 Glenfarclas has a very solid range, and they are VERY modestly priced compared to many greedy ideas we see these days. I'd say this is a big bang for your buck; anyway both the 15 yo and '105' are even bigger! I am not a whisky expert but I really like Glenfarclas, to me it tastes light, sweet and slightly spicy. After holidaying in Scotland I brought a bottle home, now that it is finished I will be buying more. I think I need to try and provide a bit of balance here! I really enjoyed this. The Glenfarclas richness was pronounced and I felt it displayed admirable complexity for its age. It put me in mind of deciduous woodland: deep, oaky and quietly alive. At this price, definitely worth a try if nothing else. The colour is far too brown looking and it tastes like it has only been half made. I don't like the bottle either! At first i found this a little austere, but on my second tasting was bowled over by the subtlety of this whisky. The fact that it is very firm and staright to the point gave the impression of a spirt without a sense of humour, but its imppecable balance and plethora of malty, nutty and sherried notes and suprisingly dryness completely bowled over this Islay drinker. Was not too impressed with this one , seemed to be very one dimentional and lacking in any character and taste , more of a mixer than by itself.